Father’s Day for Norman Ford, DMD this year will likely be one he never forgets. It’s not often that a dad gets to spend this special day seeing his children living out Jesus’ command to love God and love people (Mark 12:30-31). “It’s going to be an amazing experience to see them let God use them to be the hands and feet of Christ this week,” Norman reflects. Norman, an endodontist in Columbus, Miss., is partnering with HMM in Haiti. This week, both his daughters are serving alongside him. He says it’s truly humbling to think about as a parent and is proud of his daughters for their willingness to serve. Norman’s first international mission experience was May 2014, when he stepped in last-minute to fill a spot on a team vacated by his oldest daughter, Madison, when she learned she was scheduled to work the week of the trip. He and Mary Dade, his youngest daughter, served with a team from First United Methodist Church in Louisville, Miss. They returned home from the week-long mission excited to help organize a team from their home church, First United Methodist Church in Columbus. Mary Dade, who will celebrate her 20th birthday Wednesday, had the opportunity to work with her dad in the dental clinic last year and says it was a joy to see her dad interact with the Haitian patients. For Norman, Mary Dade became not only an extra set of hands, but a great asset to the dental clinic because she is fluent in French and could help comfort anxious patients as he worked. This year, Madison, 23, will be joining Norman on the medical and dental team; she is a recent graduate of the Mississippi University for Women’s nursing program. Madison passed her State Boards this month and is currently working as an RN in the Emergency Room of Baptist Memorial Hospital GTR (Columbus). 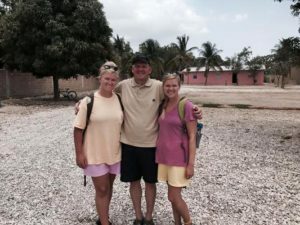 Madison says she is not really sure what to expect for the week as this is her first international medical mission, but is grateful to have her sister and dad – and their previous experiences – with her. “It’s hard to approach a trip like this where we can really only provide a temporary fix to most of the people’s medical problems,” Madison says. She adds that offering patients the eternal hope found in Jesus Christ is the real mission for the medical and dental team. Mary Dade anticipates many return trips in partnership with HMM and says it is great to be able to share with Madison why the mission and the Haitian people have come to mean so much to her and her dad. “I hope to come back year after year and share this experience with other people that I love,” she adds. Mary Dade will begin her junior year at Mississippi State University in the fall where she is majoring in Human Sciences. She plans to earn a Master’s in Speech Pathology after graduation and may be re-joining her dad and sister before too long on the medical side of the HMM experience. We are grateful to the Ford family for their sacrifice and leadership and wish Norman – and all of our fathers – a very Happy Father’s Day!